Of the patients, by the patients, for the patients. Our society’s purpose is to inform, assist and advocate for people living with head and neck cancer. This is a safe and welcoming place. What is shared here, stays here. Share only as much as is comfortable to you. Hearing others’ stories is a good growth experience. Your story is true and unique and not open to comparison. We hope that by sharing our experiences, it helps you on your journey, please use what works for you. We will use “I” statements and avoid “We”, “You”, or “Should”. Your spirituality and belief system is yours and is to be honored. We will not Judge. Thoughts and feelings are neither right nor wrong, they just are. 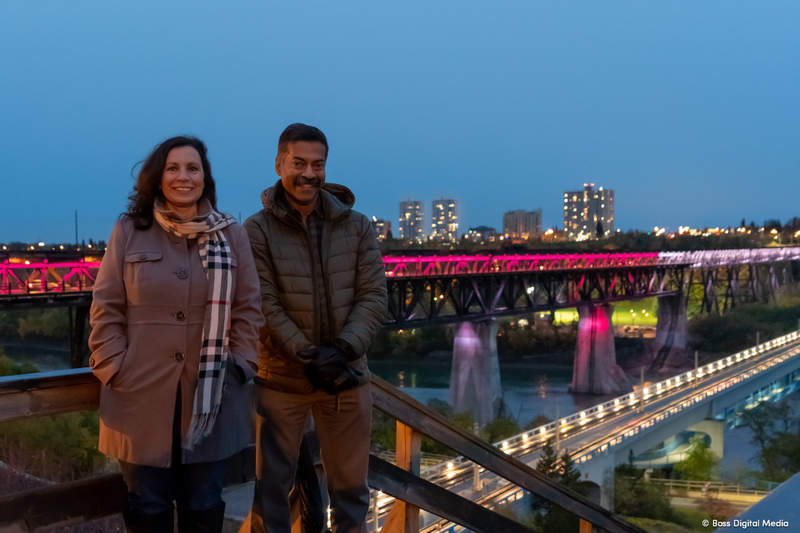 Kimberly Flowers – President Head and Neck Cancer Support Society and Dr. Suresh Nayar – Maxillofacial Prosthedontist at the Institute of Reconstructive Sciences in Medicine (iRSM), during the lighting of the High Level Bridge in celebration of the Inauguration of the Head and Neck Cancer Support Society.